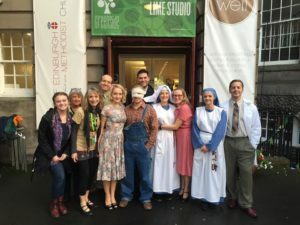 Jacqueline Coale, Sacred Music Teacher and Librarian at OLF, travelled to Edinburgh, Scotland this past summer to perform in the Edinburgh Festival Fringe- the largest performing arts festival in the world. 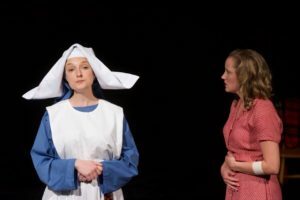 Jacqueline performed as Sister Martha in the original play Bend in the River written by Tonya Hays of Lynn Meadows Discovery Center and Gulfport native, Dustin Ballard. Bend in the River is a new play told with American Roots Music about Marine Hospital 66 in Carville, Louisiana, the only hospital in America dedicated to the care of people with leprosy, or Hansen’s Disease. This play tells the story of the patients at Carville and the people who cared for them. Jacqueline joined 13 other cast and crew mates in performing seven performances of the show in Edinburgh. While in Edinburgh she was able to see and be inspired by other theatre and opera performances, including seeing the internationally acclaimed soprano Cecilia Bartoli, and attend workshops on working with young performers. Before performing in Edinburgh, Jacqueline was fortunate enough to see Broadway productions in NYC and visit Amsterdam, Netherlands, where she was able to tour the Anne Frank House, Rijksmuseum and Van Gogh Museum. The trip was an inspiration and truly magical and she cannot wait to share everything she has learned with the students at OLF this year!